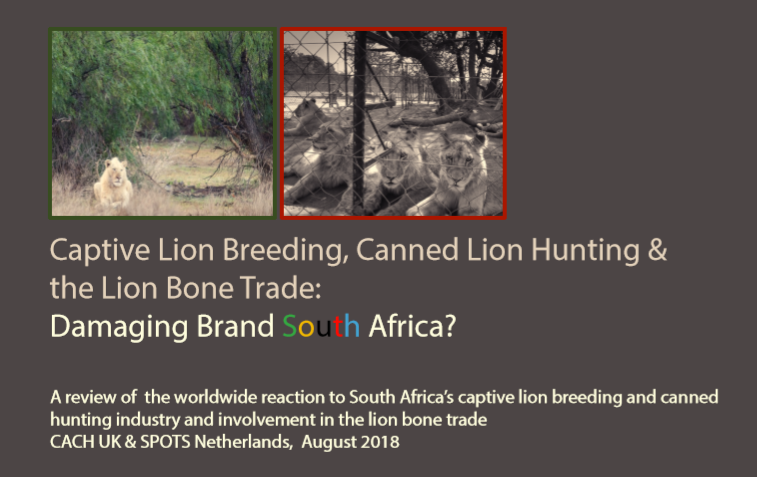 The Campaign Against Canned Hunting (CACH) and SPOTS (Netherlands) issued an updated report today, a compendium of all the self-inflicted, international bad publicity South Africa garners from harbouring the macabre captive (‘canned’) big cat breeding industry within its territory. The report catalogues the toll the ‘canned’ industry it taking (to profit an immoral few), with widespread negative consequences for South Africa’s international image and credibility. Last week, IWB wrote to Her Excellency Ms Nomatemba Tambo, South African High Commissioner to the UK. The letter is entitled “South Africa’s Reputation” and highlights the delusions being perpetuated by those that seek to somehow ‘justify’ the ‘canned’ industry/lion bone trade. It is long overdue for South Africa to ‘ban captive lion breeding and phase out captive lion hunting in a manged way’ – only then, can South Africa start to recover credibility as a custodian of wildlife (and not an unethical exploiter of wildlife as a commodity for profit only). Well done again Stephen and colleagues; this really is such an unpleasant development in South Africa and will undoubtedly discourage potential tourists if it continues. At the end of the day it’s all about profit at any cost – as was the shooting of yet another male lion shot in its prime; there is every indication it will begin to kill the goose which lays the golden eggs. Mark, Indeed profit is the overriding priority it would seem. There is no independent science to give credibility to any claims that the ‘canned’ industry (which has been on-going in SA for some 30+ years) is anything but an exploitative, immoral and unethical business that demeans iconic species for $$$ (which goes into the pockets of an elite few). The illicit hunting of a pride male, illegally lured/baited from the protection of the KNP, is yet another clear sign that the trophy and the $$$ are all that matter to those that facilitate and kill wildlife for ‘sport’ (sic). Farm murders; non-stop, violent protests; schools, universities, city halls and trains burnt out daily; massive corruption; incipient socialism; promised land grabs; foul-mouthed, lying, hate-spewing politicians; massive poverty; rampant population explosion; irreversible pollution of dams and rivers… Brand SA? What Brand SA? Nothing any lion farmer, outfitter or hunter does, can damage the very damaged Brand SA in the least. South Africa’s (SA’s) tourism industry is a key contributor to GDP (contributing some 2.9% in 2016) – despite the negative issues you have highlighted. So there is a perceived upside to SA (Brand SA), or why would so many tourists (10.29m, 2017) still visit SA? The point of the report referenced is that ‘canned’ lion farmers, hunting outfitters etc. do nothing to enhance SA’s general tourism image/brand/appeal, they do tangible damage. Note: SA’s hunting income is just 1.2% of SA’s general tourism income, or to put it another way, SA’s ‘canned’/hunting income generates less than 0.03% of SA’s GDP. ‘Canned’/hunting’s negative image puts SA’s current appeal at risk (and ‘canned’/hunting only profits an elite few of course) as a desirable tourist destination. Plus the negative image risks the significant general tourism revenues that currently comes with SA’s tourism appeal. Of course, if the “violence” etc. gets worse, then then the tourists will stop coming to SA anyway. But in the meantime, why risk SA’s tourism appeal just to permit lion exploiters etc. to take profits for themselves?